Stress FREE and mess FREE for mom and dad. You just have to supply the Birthday Kid, some friends and a cake of your choice. We’ll supply a slice of pizza and chocolate milk for each party-goer. Additionally, we’ll set the table with birthday themed plates and napkins and supply a loot bag for each child. We even mail you our custom birthday party invitations. How’s that for simple! 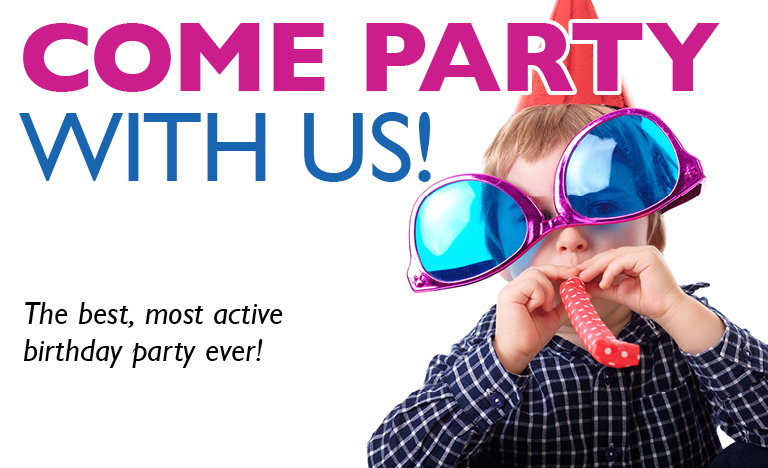 Each 2-hour birthday party includes: 1-hour of active play led by one of our nationally certified coaches, followed by 1-hour of exclusive use of our birthday party room where the kids can enjoy pizza and milk, the cake you bring and then open gifts. Parents are welcome to watch the in-gym time from our comfortable viewing lounge and then join the party when the kids move upstairs to our birthday party room. Birthday Parties start at $199 (all inclusive tax FREE) for up to ten friends plus the birthday child – sixteen friends for $289 or 24 friends for $359. Parties must be paid in full at registration. After you have made your registration please email jen@guelphsaultos.ca to arrange mail delivery or a pick-up in person option for your complimentary invitations.